Late 19th-c Britain. 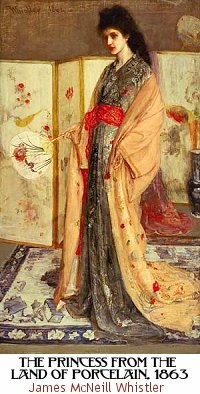 Influence of Japanese style on the decorative and fine arts. Aestheticism was basically art for art's sake, making things purely for their inherent beauty. The common feature was therefore more philosophical than design-based. The dominant medium for Aetheticism was ceramics - hence the parody teapot shown here. 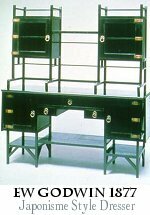 Furniture, jewellery and even architecture were also influenced by Aestheticism. Some Pre-Raphaelites were involved in the Aesthetic Movement, although they generally leaned more towards the beliefs of the Arts and Crafts Movement so we'll deal with them in more detail next week. 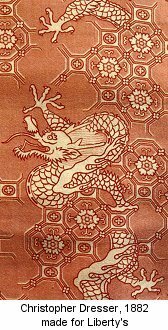 Exotic eastern influences, in particular Japanese styles and designs, were of great importance. 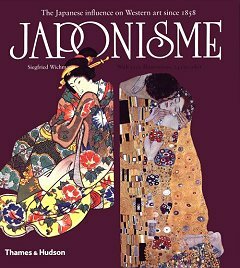 This particular influence within the Aesthetic Movement is known as Japonisme or Japonaiserie. There were exibitions of Ukiyo-e art in Paris during the 1860's, and the resulting popularity of anything Japanese in style spread through all fields of both Fine and Decorative arts, as well as design. 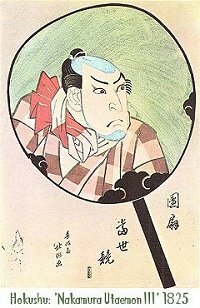 The Ukiyo-e "Floating World" school of printmaking in 18th-19th-c Japan included such artists as Hiroshige. Their subject matter was non-heroic, based on a notion that all is transient. The subjects were often everyday. They were mass-produced as woodcuts, cheap enough for the average Japanese person to afford. They weren't considered Fine Art in their native context, but they had a huge impact both on Fine Art (eg: French Impressionism) as well as the decorative arts. 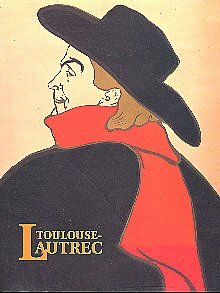 Graphic designers such as Toulouse Lautrec were especially influenced by Ukiyo-e. Architect and furniture designer who was an important figure in the Aesthetic movement. Designer, writer. Maker of those oh-so-perfect-it's-difficult-to-live-up-to teapots. He travelled to Japan to find goods to import for sale by Liberty's of London. What he saw there affected his own work very much, and the stark simplicity of some of his work now looks far ahead of it's time. Lisa Iley's very thorough tutorial looked at the works of Christopher Dresser. 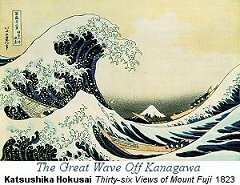 As another example of the Japanese influence, compare one of the most famous Ukiyo-e prints, "The Great Wave Off Kanagawa" by Hokusai with "Wave Bowl" by Christopher Dresser. Look familiar? Imported and commissioned local designers to make homewares in the Aesthetic, Japanese, Chinese and other exotic-influenced styles. They were famous for lush textiles, embossed wallpapers, silverware and other exotic and opulent household goods. Liberty's good often looked reminiscent of the parallel Arts & Crafts Movement. The main difference was that Liberty & Co were completely commercial, not motivated by social concerns as were Morris & Co and the other members of the Arts & Crafts Movement. Although Liberty & Co started off producing a wide range of exotically-influenced designs, over time they moved away from this Victorian aeclecticism into a more clean, streamlined style, such as in the silverware of Archibald Knox. This developed into a branch of Art Nouveau, which we'll be covering later. 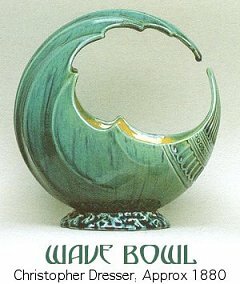 Many of their designs of both Liberty's early aeclectic and later Art Nouveau periods are still produced today. US born, Whistler studied art in France then moved to London, and many of his best-known works were painted there (so I've included him in the UK Aesthetics). John Ruskin, Art Critic and philosopher of the Arts & Crafts Movement, particularly disliked Whistler's works - which just added to his noteriety. Whistler in fact sued Ruskin for libel and won - although was only awarded a penny in damages, which certainly did not offset the loss of income he suffered as a result of having one of the leading Art Critics of the day on a mission to destroy him. 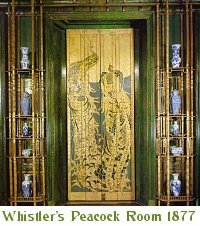 Although Whistler was predominantly a painter, he is given much credit for his interior decoration of the Peacock Room. Peacocks became popular symbols in Whistler's followers such as Aubrey Beardsley (see Art Nouveau lecture). He created this interior for his patron Frederick Leyland's London home. They had a bitter falling out over the room though, and along with the troubles with Ruskin losing him many commissions in the conservative environment of late Victorian England, he was financially ruined. 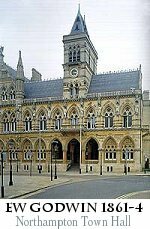 He was declared bankrupt in 1879, but then went on to considerable success as a painter. 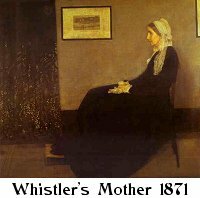 His most famous painting, titled "Arrangement in Grey and Black: Portrait of the Painter's Mother" is more commonly known as "Whistler's Mother". 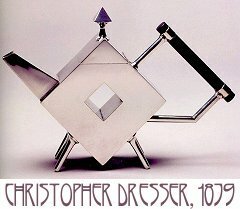 The Aesthetic movement was widely parodied at the time, for example by Punch magazine and this amusing teapot. 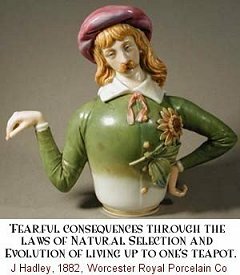 "The Fearful Consequences... of living up to One's Teapot". The British love to laugh at people who take themselves too seriously, and the Aesthetic Movement certainly took itself very seriously! Relationship between literature, art and design - eg, symbolism. References: Much of the above text is from lecture notes prepared by D. Armstrong. please email me on kat@retrokat.com and I'm more than happy to do so.